• Extends the life of rods and tubing by reducing wear. • Reduces energy requirements by reducing drag. • Reduces lost production by extending time between work-overs. 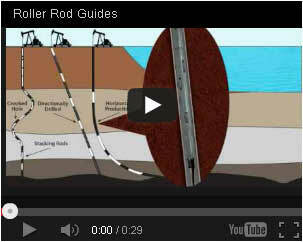 • Reduces drag in directional wells. • Reduces the need for sinker bars by adding weight and reducing drag. • Rollers are field replaceable. Utilizing the data from your directional survey, we can provide you with a computerized sucker rod, side load and drag analysis. This data helps determine the placement of the Roller Rod Guides.